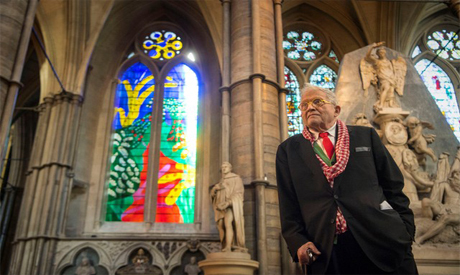 Westminster Abbey, the site of royal coronations, weddings, burials and resting place for famous Britons, on Wednesday unveiled a new stained glass window honouring Queen Elizabeth which artist David Hockney designed on an Ipad. "The Queen's Window" transforms a previously plain glass window into a colourful rural scene inspired by Hockney's native Yorkshire and featuring hawthorn blossom. The 81-year-old Hockney, known for his brightly coloured pop artwork, depictions of swimming pools, portraits and landscapes, was tasked with designing "something symbolic or representational of the subject". "The iPad is back-lit like a window. It's a natural thing to use," Hockney was quoted by The Telegraph newspaper as saying, adding that this was his first stained glass work. "I learnt something about glass. It was a challenge."